It's A Long December, Month Ends With One Win · Let's Go Amerks! Â The Amerks were shutout by the Syracuse Crunch by the final score of 4-0, the second game in as many nights they failed to score any goals.Â The Amerks were held to just 19 shots while allowing 32 for the Crunch.Â Things aren’t going to get any easier as they head to Toronto to play the first place Marlies on Wednesday night. 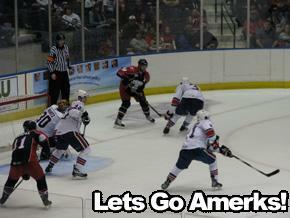 The Amerks were unable to produce any real scoring potentials and went 0 for 5 on the power play. Crunch forward Philippe Dupuis gave the Crunch a 1-0 lead at 5:01 of the first. Adam Pineault scored his seventh of the year to make it 2-0 at 4:35 of the second. Tom Sestito tacked on Syracuse’s third goal of the night at 10:12 of the third. Sestito scored again at 12:40 of the third. The game seemed to have been played by the Amerks in slow motion as the Crunch had no problems skating around our defense as well as putting the puck on net. David Shantz saved 28 shots and fell to 1-10-1 on the year, but like many of his other losses itÂ can’t be put solely on his shoulders.Â There was a lack of offense, and on two of the four goals our defense was beat.Â The Crunch also had eight power plays which resulted in two goals. Crunch goaltender Craig Kowalski recorded his first ever AHL shut out tonight. Clarke MacArthur returned to the team after a brief two game stint with the Sabres but he also failed to produce any offense with no shots on goal.Â He also injured his hip flexor and didn’t seem too optimistic about the outcome. Drew Larman said he has an appointment with his doctor on Monday and is expecting to be cleared to play on Wednesday against the Marlies.Â He has only played in 16 of 36 games this season. The Amerks are now 11-22-3 on the season, have lost 12 of the past 13 games, have allowed the most goals against in the league, and there is still a highly uncertain future in store for 2008. As we left the post game party atÂ Nathaniel’s the last song we heard was ‘I’ve Seen Better Days.’Â What a fitting song to end the year. I’m hoping to write an article tomorrow to talk some more about the current state of affairs.